Are you still managing compliance in spreadsheets and paper files? How about those long email chains between departments? Did you know there’s now a better way? ComplyAssistant’s healthcare compliance software platform is your solution for a more organized, more efficient compliance process. Innovative, elegant and easy to use, ComplyAssistant’s healthcare compliance software is developed and maintained using AGILE methodology, which means we are quickly and continuously updating, improving and releasing new functionality. And, because our software is cloud-based, you don’t need to worry about maintaining any on-premises equipment or technology. 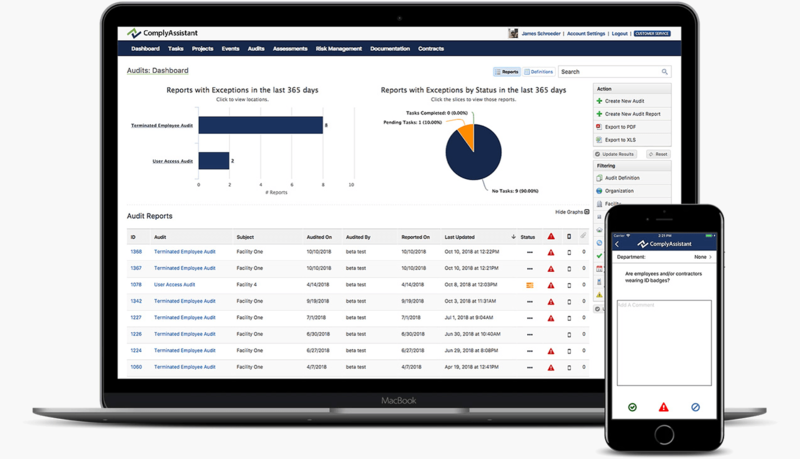 For each location in your organization, record compliance and risk levels, assign risk mitigation procedures and document compliance processes. Thoroughly document incident information to ensure your organization follows a standard process each time. Create location-based assessments to gather answers from within your organization. Manage government regulations, such as HIPAA and HITECH, with pre-packaged and customizable audit definitions. Manage and document healthcare compliance activities in a collaborative atmosphere with automatic, real-time email notifications. 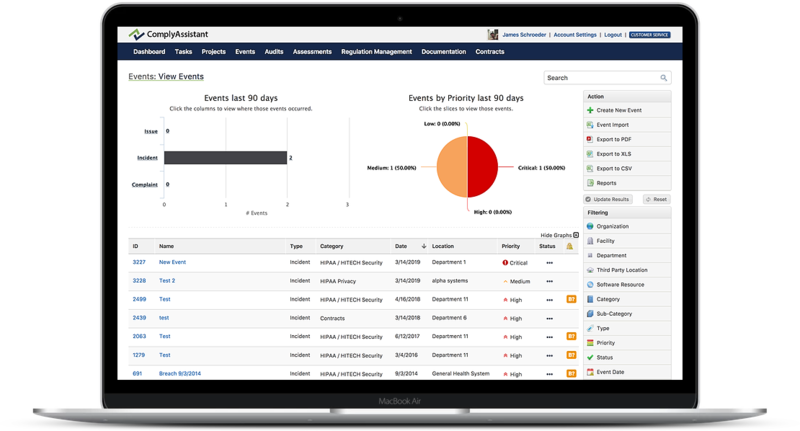 Quickly and easily view any overdue and pending tasks, charts of risk and compliance levels, and recent activity. 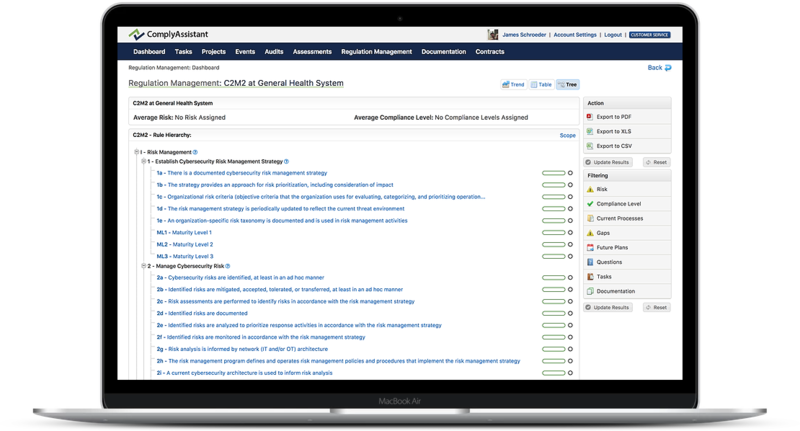 Define and assign contract reviews and schedule alerts based on key dates, with a customized task workflow design. 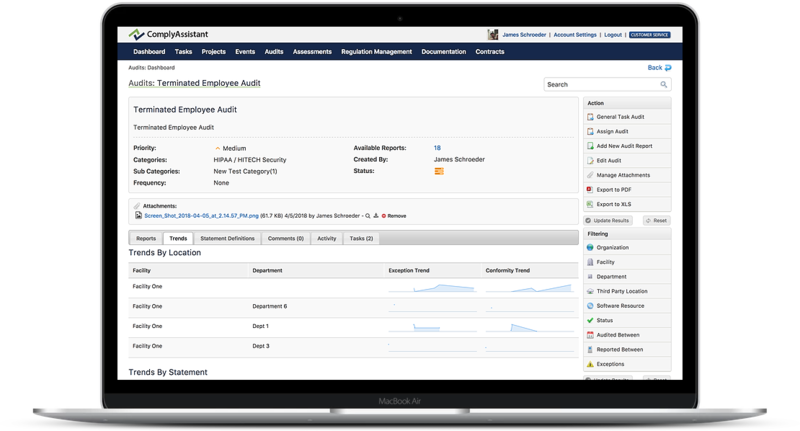 Manage compliance activity, policies, contracts and project tasks using team collaboration. Access rich regulatory content for a variety of cybersecurity frameworks. Create and publish your own rulesets for governmental regulations without waiting for a new software version. Use key questions and guidance to determine if an incident is a HIPAA-HITECH Omnibus breach, and if the breach is reportable. Use smartphones and tablets to conduct audits, such as HIPAA facility audits and patient safety rounds. Easily audit your third-party business associates (BAs) with pre-defined or custom external assessments. 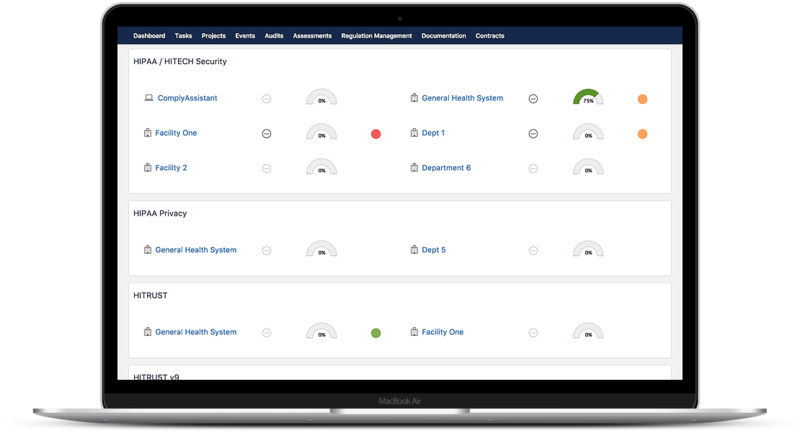 With a full set of features, you can tailor our healthcare compliance software to fit the needs of your organization. 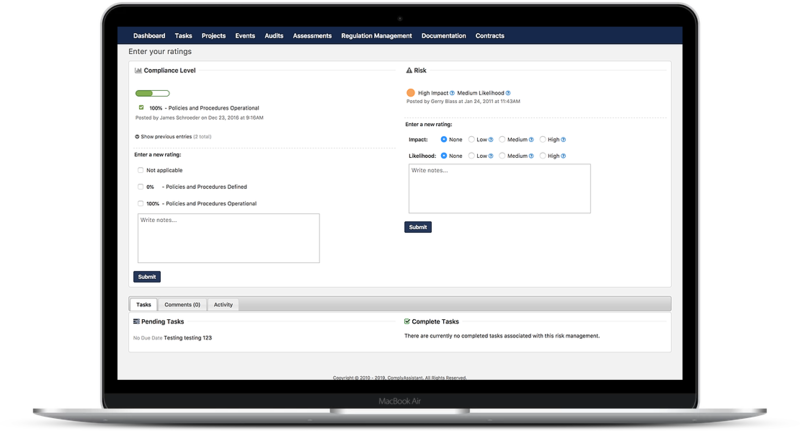 All of your compliance initiatives can be managed and housed directly in our platform, making it easy to juggle a wide variety of documents, assessments and reports. 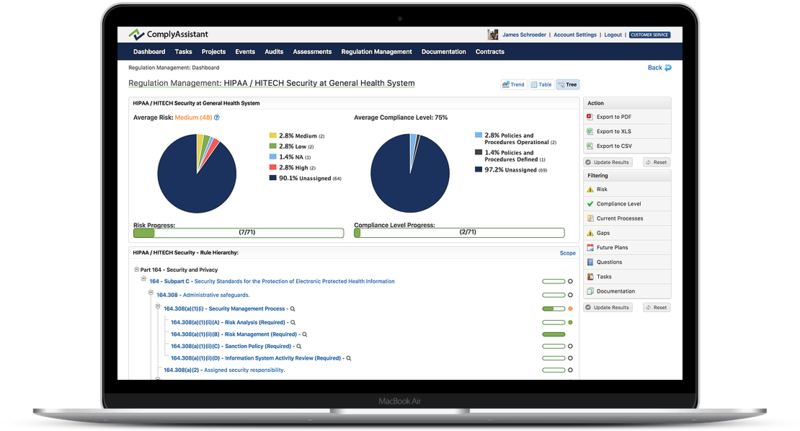 Manage HIPAA policies, procedures and evidence of operational compliance. Build and implement a framework using NIST guidelines and structure. 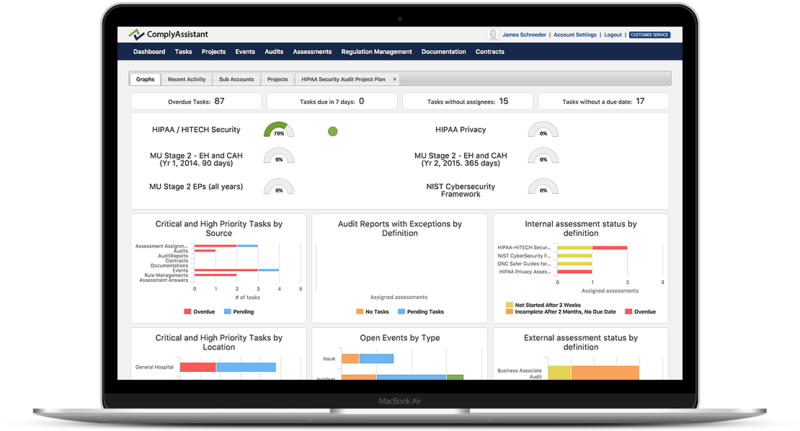 Answer HITRUST assessment questions, manage tasks, track standards documentation and manage maturity levels. Access rich content, track progress and attestations, and analyze results. Manage security standards around credit card and payment accounts. Prepare and organize hospital and ancillary facility accreditation materials. that provides guidance, organization and collaboration. With flexible setup and pricing, ComplyAssistant’s healthcare compliance software meets the needs of both small and large organizations. We also provide ongoing training and custom development for managed service providers (MSPs) to assist their clients with IT- and HIPAA-related services. Not ready to manage healthcare compliance on your own with just software? That’s okay too. Our experienced healthcare compliance consultants are ready to work one-on-one with you to build and maintain your compliance program. "ComplyAssistant’s cloud-based software solution allowed us to efficiently and effectively manage the entire compliance process, from assessment development and distribution through management of action items." Ready for a consultation and demo of our healthcare compliance software? Healthcare organizations across the country, from large systems to small physician practices, turn to ComplyAssistant. Read their stories.